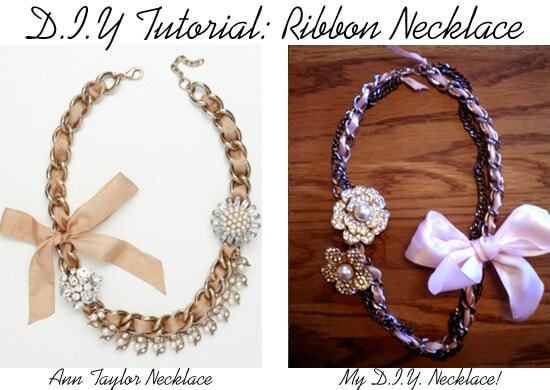 After reading through your comments on my last DIY tutorial, I saw how much you guys love these tutorials, so today I’ll show you how to make a fantastic piece of statement jewelry – a ribbon necklace. For this necklace, I was inspired by the Ann Taylor necklace (above left) that retails for over $100. I love the femininity of it, but also how it combines a chain and some sparkle with girly details. This necklace would be the perfect accessory for an LBD at night, but is also casual enough to throw on over your white tee and wear to class. Read on for the 2 easy steps so that you can make your own necklace, too! 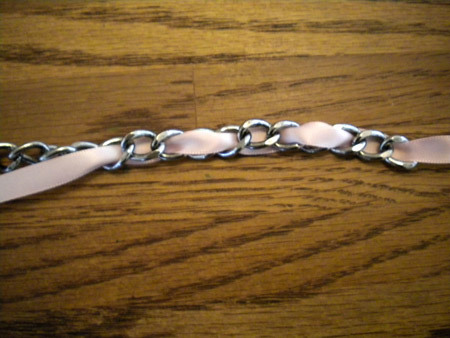 A chain – You can get this at a craft store. Just make sure to buy one that is wide enough that you can weave ribbon through! 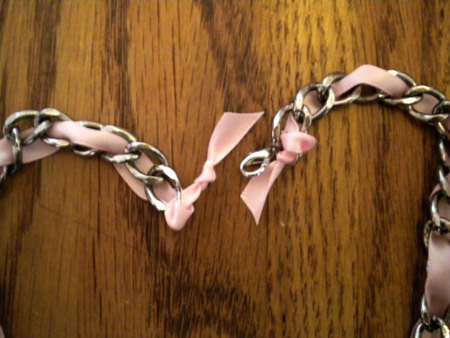 Ribbon – I chose a light pink for a feminine effect. Cute pins or brooches – I used two brooches in this tutorial. You can find cheap ones at Forever 21 or look for vintage brooches at Goodwill. Take the ribbon and weave it through the chain. At first I chose to weave it through every other link, as shown above, but you can also braid it through every link, as shown in the last finished picture. Which style you choose will affect the overall look and style of the necklace, so experiment and see which you like best! 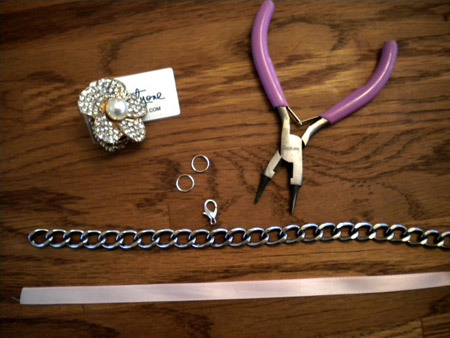 After you finish weaving the ribbon through the chain, use your pliers to open each of the two jump rings, and secure one at either end of the necklace. You can use your pliers to close one of the jump rings, but leave the other one open and attach the clasp to it. To keep the ribbon in place, I knotted each end onto the jump rings, and then trimmed the ribbon down. Now, the last step is to pin your brooches on, and tie your bow in place! 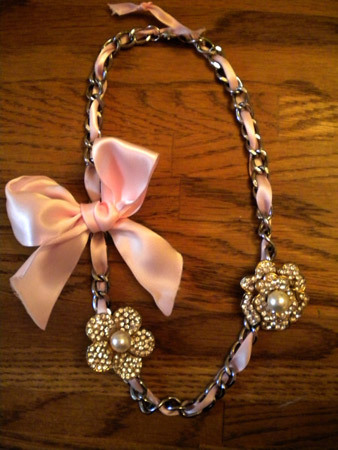 This was my first attempt at making the necklace, and as you can see, I wove the ribbon through every other chain, and attached 2 similar-looking brooches on either side. Once I was done, I decided to play around with the necklace some more, so I added another chain and twirled it around the first. I also tried securing both brooches on one side, but found that the weight distribution was too unequal. 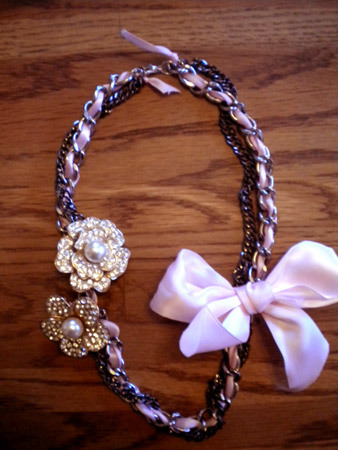 By weaving the ribbon through each chain link and adding an extra chain, you can toughen up the look of the necklace. This version would make a great statement piece to wear with a leather jacket! What do you think? Do you like this tutorial? Do you make your own jewelry? Where do you look to for your jewelry inspiration? Will you be trying this project? Are there any specific tutorials or types of tutorials that you would like to see in the future? Let us know with a comment!